1. Why didn't I think of that? 2. I never would have thought of that. 3. Why didn't Palm think of that? BugMe! Messenger falls into the latter category. There are two problem I have with Graffiti, time and anger. Ever been with a non-Visor user and they want to give you some fast info? You yank out your handy dandy technology and say "Go ahead. Wait. Okay go ahead. Stop. What was that first part? Right, okay just let me fix this little thing here. Okay, now what time was that? Right, and the phone number? How do I make that little e-mail thingie? Oh hell, gimme a piece of paper." Now I consider myself quite good at Graffiti. The problem for me is that my ears, my eyes and my hand are sharing the same obsolete processor, my brain. So, there are times I bypass my Visor for paper (and then of course I lose it). I know, it is a shameful thing to admit to a crowd of rabid Visor owners, that a proponent and evangelist of the virtues of handheld technology would resort to something so retro as paper and pen (to the gallows with you, sir). Back all of you, back I say! I have discovered the virtues of BugMe! Messenger, and paper shall never again touch these hands. First of all, to avoid confusion, there are two applications - BugMe! and BugMe! Messenger. Since BugMe! Messenger has all the functionality of BugMe! plus a whole lot more, from here on when I refer to BugMe! I am in fact referring to BugMe! Messenger (whew). Let me give you an example how useful this program is with an example. *In this example, the characters of Talan and Sara are imaginary people. Any likeness to Alan Graham and his fiancé Dana is pure coincidence. Sara says to Talan, "Hey, I need you to call me Monday at 10:00 AM. Let me give you my number." Talan whips out his Visor while asking why Sara doesn't have one of these things, so Talan wouldn't have to write it down. Sara says something pithy about how she likes her current paper address book and then makes a Gameboy comment. Talan thinks to himself, "Whatever" and turns on his Visor. Instead of going to the Notepad or Calendar he pulls up BugMe! and taps the icon to create a new note. 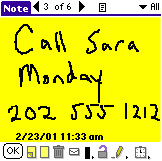 In his own handwriting, he pens: Call Sara Monday 202 555 1212 (apparently Sara works for Directory Assistance). Then Talan taps the Alarm button and sets a reminder for Monday at 10:00 am. Lastly, Talan enters Command: T and puts a date/time stamp on the note for proof of when he wrote the memo. That way she can't say he didn't write it down and he can't be blamed for forgetting. If Talan taps the "Lock" icon, he can be sure that the note will not be altered or deleted. Simple and effective. I, er Talan accomplishes the same task as the Calendar in about half the time, with zero frustration on his part or, ahem, Sara's. Now if you are satisfied with a simple and elegant way to quickly input data into your Visor, than BugMe! Messenger is just the thing for you. However, we've just scratched the surface.